svAmi aruLALa perumAL emberumAnAr was a person who understood the esoteric purports of vedic scriptures. He knew the means to reach the ulterior motive mentioned in them. He also knew that exact motive (namely sriman nArAyaNan and HIS devotees for their happiness). He was foremost among the people who knew the truth as it is. He was a person who wanted liberation of all the souls in the universe who are suffering from the innumerable cycle of births and deaths. He served as a disciple of svAmi ramAnujA for a long time (almost 80 years) and served him all those years. He listened to the teachings of svAmi ramAnuja about thathvam (true concepts), hitham (means) and purushArtham (benefits) and learned all their significance. He stood by his AchAryan’s teachings in his daily life. 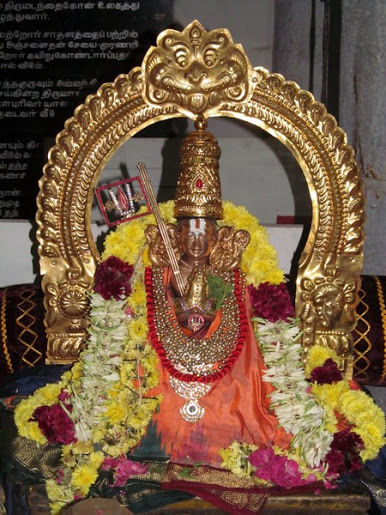 Thathvam is the perumAL, hitham is the means to reach HIM and purushArtham is the benefit of reaching HIM. He understood the true meanings of these concepts in its entirety. This is known as “thala sparsa gyAnam”. “thala” (the thamizh equivalent of sthalam that means “earth” and sparsa would mean touch. A person who dives in waterbodies would go all the way to the bottom, touch the sand and get it to the shore. Likewise, svAmi aruLALa perumAL emberumAnAr was a person who knew the ultimate end of all knowledge. This goes ahead and shows her gifted acumen. The first step is to know about perumAL. The last frontiers is to know about the significance of HIS devotees. This is nothing but to be a devotee of HIS devotee. A person with such highest merits, svAmi aruLALa perumAL emberumAnAr, out of his extreme compassion, gave us a book called “gyAna sAram” with which evne a laymen of this materialistic world who is suffering from karmic cycle forever, can be liberated. After having finished gyAna sAram, he wrote pramEya sAram. vEdham is something that was not written by anyone and something which has been there forever. Just like perumAL, the vEdhAs themselves has no end. Hence vEdhAs are known as the “prAmAnams”. The essence of these vEdhas is contained succinctly in “thirumanthiram”, which is “Om namO nArAyaNAya” (eight syllaballed manthiram). 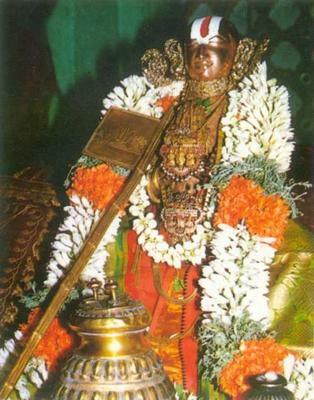 The essence of such thirumanthiram is what is being given in this work called pramEya sAram. Hence this work is called as “pramEya sAram”. This entry was posted in Other, pramEya sAram on December 10, 2015 by venkatesh erumbi.